Winemaker’s Notes: Deep red, intense aromas of black fruits, plums, cherries, chocolate, and cassis. Concentrated, with sweet tannins. Red fruit flavors. Good structure and density. 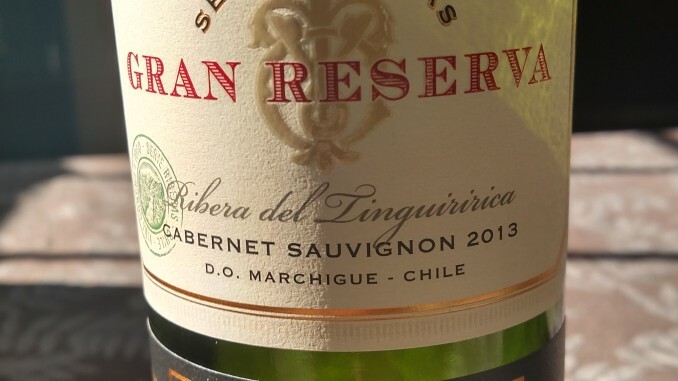 My Review: Wrapping up my look at the three Gran Reserva Serie Riberas wines, we have the 2013 Cabernet Sauvignon. Unlike the other two wines I looked at (the Malbec and the Sauvignon Blanc), this wine isn’t a single varietal, and instead features Carmenere and Cabernet Franc added into the blend. Whether this was a decision made for flavor or because of harvest yield I don’t know, but it was something that jumped out at me. Anyways, on to the wine. In the glass the wine was a nice deep red, and on the nose I picked up cherries initially, with chocolate coming through the more the wine opened up. In the mouth the wine showed a medium body, with flavors of red fruit leading the way. As the wine opened I once again found those chocolate notes. Unlike most wines, I didn’t pair this one with anything, instead choosing to just enjoy it by itself, and here I think I appreciated the addition of the Cabernet Franc, as even that little bit helped to balance the wine, preventing what could have been a big, food necessary wine and making it an approachable, easy to enjoy wine that just so happens to probably go really well with food. While I didn’t pair this one with anything, I think it’s safe to say that any red meats, pasta with red sauce, or roasts would be a good one to match it up with. With our unseasonably warm December (at least in my part of the world), the grill is still very much in play, opening up several possibilities for pairing this wine. At $17 it’s also a great value, and with only a few days left until Christmas, you could do a lot worse than showing up for dinner with a bottle of this in hand to share with friends and family.